January 22nd marks the 25th anniversary of my brother’s murder. I have devoted one- quarter of a century, one-half of my adult life to my brother and my country. I held out hope that those representatives in my country’s institutions whose oaths of service demanded truth, justice and respect for “the rule of law” would be at my side through this inconceivable journey. Their absence has been deplorable! With the help of a dedicated small group of true patriots, I have exposed behavior in our government that is reminiscent of the vilest regimes of the 20th century. I have been caught in the middle of murders, cover-up, evidence tampering, intimidation and virtually every other imaginable crime in an effort to silence me. But I will not be silenced! The strain on my family has been incalculable. There is nothing in my life that has not been affected-my marriage, my children, my health, my profession, my finances. But not my faith, because I know that I am doing what I have been called to do. 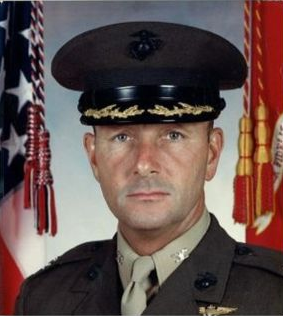 I’ve experienced dozens of low-points in these 25 years but the nadir was reached when US Attorney General Alberto Gonzales informed me that the Department of Justice had no jurisdiction to investigate the death of Colonel James E. Sabow, USMC, who was murdered while on active duty on the El Toro Marine Corps airbase which was under exclusive federal jurisdiction. He referred me to the Attorney General of California in spite of the DOD and DOJ for years prohibiting the AG of CA to be involved. How alone can one feel? How does one awaken and live each day trapped in the classic Kafkaesque life? How low can my country go? How much more pain can these people inflict on my family and me? Is there not anyone in Washington who is not repulsed, not only by the murder of a true hero but by the methods used to kill him? How can anyone not be sickened by the way he was lured from his house into his backyard where he was bludgeoned to death by a massive blow to his skull and then shot in his mouth with a 12 gauge shotgun blast, hoping to destroy the evidence of the skull fracture and stage a suicide? I am reaching out once again begging for help for me and for my country. I believe that when this horrible odyssey is exposed, an awakening of America from a complacent sleep will occur. Then my brother’s death and my family’s pain will be assuaged. Perhaps then, morality will return to our country. Duncan, you have an opportunity with the help of your congressman son to make this happen. It is time to bring Colonel Sabow’s body and reputation back from the battlefield. Thank you John David Sabow , MD for doing great service to your brother. A wonderful letter. Many people thinking of Colonel James Sabow, of you and all the friend and family. We will join in a prayer today as we do at Abel Danger on every live broadcast.